SAR026956 SCOTLAND (1956). Easterhouse Estate Old Monkland, Lanarkshire, Scotland. An oblique aerial photograph taken facing North/East. This image was marked by AeroPictorial Ltd for photo editing. 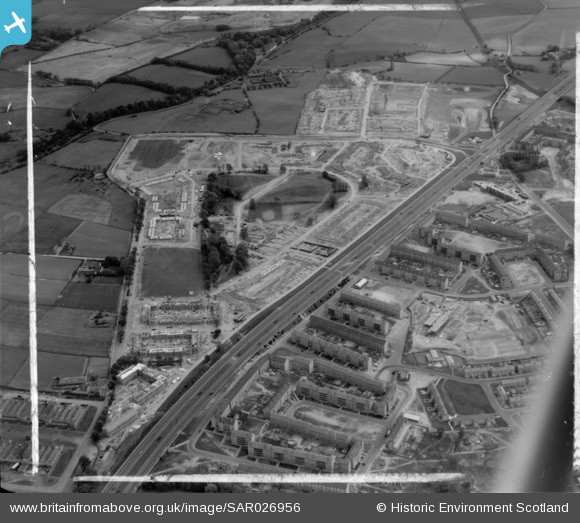 Title [SAR026956] Easterhouse Estate Old Monkland, Lanarkshire, Scotland. An oblique aerial photograph taken facing North/East. This image was marked by AeroPictorial Ltd for photo editing. Just out of shot Larchgrove Remand Home. Number 5 Easterhouse bus roundabout here. 2017~ Local shops, Hallhill Rd. Smiley's garage. In the 1970's I was filling my car up with petrol in there and a VW Beetle driver (woman) hit reverse instead of first gear and hooked my front bumper proper. It took about eight people to lift my car off the offending vehicle...it's the only thing I remember about this garage.